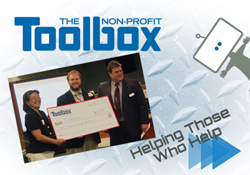 The Non-Profit Toolbox is all about helping those who help by building a community; collaborating; educating and providing valuable resources. The Non-Profit Toolbox (TNPT) is a joint venture of south shore Massachusetts experts from the following industries: business, finance, organization, administration, design, development, marketing, web, and social media. TNPT is all about helping those who help by building a community; collaborating; educating and providing valuable resources.